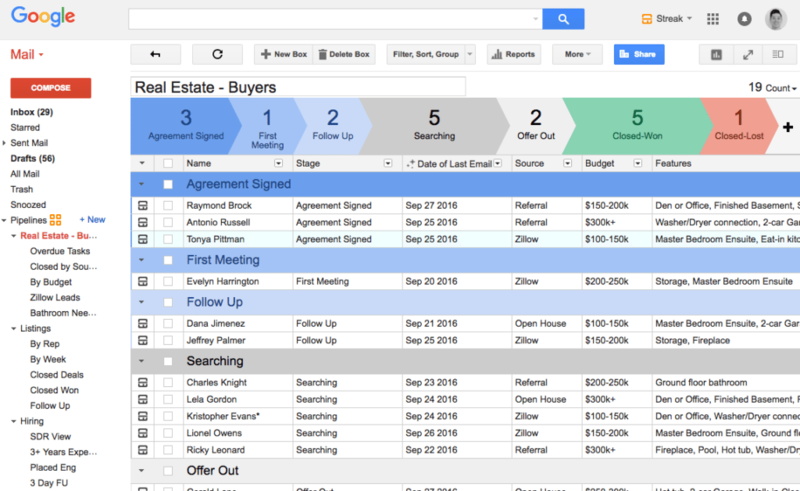 Streak is a CRM built for and used directly in Gmail. Gmail integration. Streak’s blending with Gmail’s intrinsic functionality strengthens the willingness to use it and eases the learning curve. Streak’s value to your business increases with every email you send and receive. Always on. If you’re a Gmail user, your CRM is always on, ready to power sales. Streak is not overly intrusive. Users can quickly switch in and out of its features. Personal messaging isn’t encumbered with sales efforts. Saved filters. As your email threads grow, Streak makes it more powerful. Custom designed filters can sort contacts by “Last Date Reached,” “Previous Seller,” or “Closed in 2015.” When saved, each filter becomes another view into your sales pipeline. Google-heavy. Outlook users and less Web tech-savvy agents on your team may not grasp Google’s interface sensibilities, from which everything in Streak is derived. Definitely a niche product. So much business begins and ends in our inboxes. Yet we treat email as a go-between, a conduit between contacts and CRMs. Streak cuts that connection by combining the two, and fans of Google-driven productivity will immediately recognize its benefits. A primary advantage to implementing Streak is fast agent adoption. Busy agents won’t have training sessions to endure or support lines to wait on. There isn’t a large enterprise system to install. A mass import of contacts isn’t needed; everything is pulled from your existing inbox. A contact’s lead status is determined by labels you create. Is that person a hot lead or an eight-month follow-up? An active client? Clicking icons next to names in your inbox presents an in-window record with contacts pertinent info, such as the entire email history, phone numbers, lead rating or whatever field type you include. With categories established, Streak deposits incoming messages accordingly. Every email conversation with a contact gets bundled with their record, so contact history is at the ready. Records, or “Boxes,” can be shared and controlled among team members. Streak’s color-coded categorization first appears jarring. Once your eyes settle, it’s a terrific way to sort priorities. In seconds you know whom to contact today or how much commission a sale will generate. Agents will be interested in Streak’s mass email capability. Every member within a category can be contacted simultaneously, however, it arrives as an individual message. 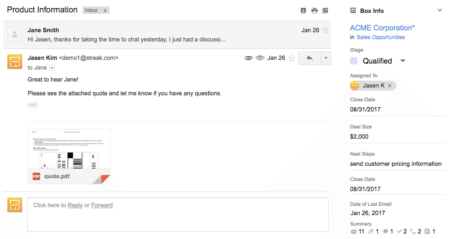 Because the message originated from your Gmail account, it hits their inbox cleanly, with personalization. It also becomes permanently part of that Box. Attachments get associated with Boxes automatically, and removed from the email for access outside of the message. You can upload files directly, as well. Streak makes sales personal, for both users and customers. 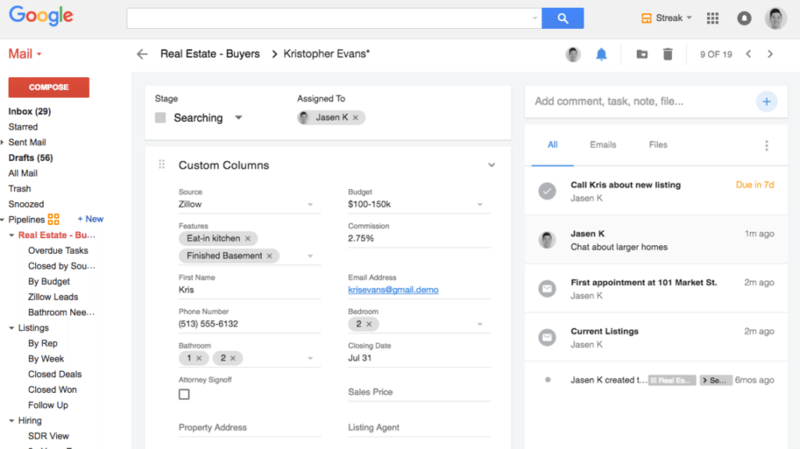 I believe agents benefit from its ease of implementation, flexibility and leveraging customer data usually left buried in email. Do you use Streak — and what do you think? Leave a comment and let us know!